Spot Prawns: BC’s most sustainable seafood . . . or is it? The rain didn’t deter visitors to the Cowichan Bay Spot Prawn Festival on Sunday. It seemed there were almost as many people as there were prawns! While I spent most of my time there manning the Cittaslow booth, I did get a chance to do some tasting too. Denis did the shopping for us and we came home with fresh prawns (of course) from Cowichan Bay Seafoods, two kinds of ravioli from Cowichan Pasta Co., a baguette from True Grain, goat cheese from Hilary’s Cheese, VerJus from Venturi Schulze, and three Habanero jellies from Valhalla Herbs. We’re so lucky to live in this area and have access to fresh local seafood and produce. Spot prawns are touted as being BC’s most sustainable seafood. I was told yesterday, however, that right now there are 15,000 commercial prawn traps in Barclay Sound alone, each permitted to be pulled daily. With numbers like that, can this fishery be sustained for long? Today, we simply enjoyed the bounty that this area has to offer. Once we got home and dried off, we munched on the baguette slathered with chevre and topped with Valhalla’s Black Fire jelly before deheading the prawns and preparing our pasta. In 5 minutes, we had fabulous Cowichan Pasta Co. ravioli, tossed with olive oil, VerJus, and fresh herbs and topped with a few prawns. All that was missing from our “locavore” dinner was a local wine, but we enjoyed a great Argentinian Malbec. This entry was posted in seafood and tagged prawns, ravioli. Bookmark the permalink. 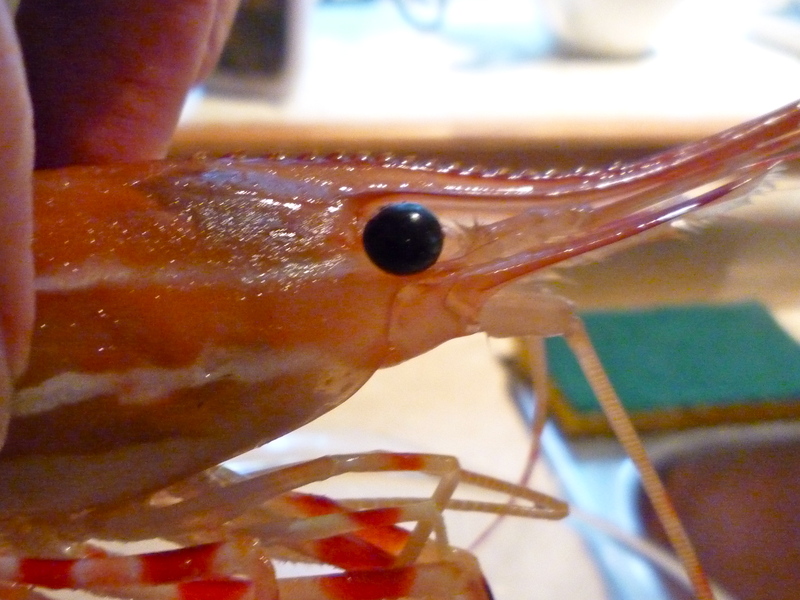 1 Response to Spot Prawns: BC’s most sustainable seafood . . . or is it? It was a wonderful day in Cowichan Bay. Denis did an excellent job shopping and you are generous of spirit to man the Cittaslow. It is wonderful to hear a local teacher is actively taking a proactive role in promoting local sustainability. We don’t have all the answers but it is good to keep thinking and enjoying living a good life in such a wonderful local.